I am 25 years old and decided to pack up and sell my life in Los Angeles as a part of my quarter life crises. With a one-way ticket in hand I started on a year-long rtw journey in November 2008. 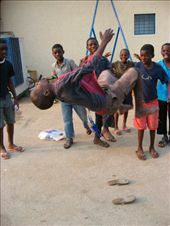 Joyful - Despite growing up amidst bloody wars and extreme poverty, Angolan children abound with joy. They bring with them the hope for a better Angola.